A man in his 60s was killed Friday evening when a Caltrain rammed into his car on the tracks at Charleston Road in Palo Alto, in what officials believe was an "intentional act." The crash involved northbound train No. 277 and was reported just before 6 p.m. A witness, Robert Jonas, described the "ugly accident" on Twitter and said that the "car was thrown into nearby backyard fence." "No matter what the circumstances, it is always regrettable when a life is lost," Caltrain officials said in an email. A bus bridge was established between California and San Antonio roads, but Caltrain officials tweeted that it was "tough to scramble extra service" because of the Christmas holiday. Delays were reported as emergency personnel responded to the collision. Caltrain officials single-tracked trains through the area. This marks Caltrain’s 11th fatality of 2016. Last year, 20 people were killed on the Caltrain right-of-way. 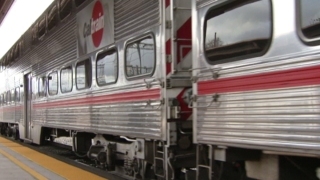 "Caltrain reminds everyone to be safe around train tracks," officials wrote. "Caltrain also would like to thank our passengers for their patience as we deal with these sad incidents." Update: At approximately 5:57 a vehicle on the track was struck by NB277 at Charleston Ave in Palo Alto. There was one confirmed fatality.